Near the cement walk at the head of the ravine at Allegheny College is a small stone with the Latin phrase "Spes sibi quisque" meaning "Everyone is his/her own hope" and signed by the sophomore class of 1880. 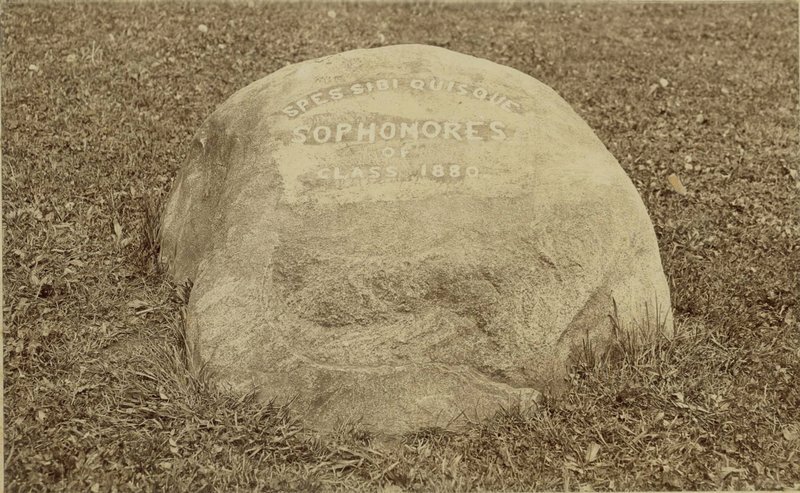 Back in the spring of 1877, the sophomores were looking for some way of distinguishing their class and giving it a monument. They had no money, but someone came up with the idea of a stone. A class committee, led by Ida Tarbell, picnicked on numerous hillsides, in search of the right stone. One was found that was not too big to move, and the sophomores were quite pleased when it was in place. They were sure that the only prank their rival class, the freshmen, could inflict on the stone was whitewash. But one morning it was found rolled into the ravine. The stone was too heavy to carry up, and all seemed lost until a little known student in the class proposed a solution. A mechanic, he arranged a sling attached to pulleys and winches that successfully restored the rock to its rightful place. For the remainder of the term sophomores kept watch from Bentley and fired warning shots with a rifle whenever they spied freshmen sneaking toward the stone in the dead of night. Only after commencement was the inscription added. “The Sophomore Stone,” NW PA Heritage, accessed April 26, 2019, http://nwpaheritage.org/items/show/29.